From the rear facing where the back cover locates, you can start to open the back cover from top side of the Samsung Galaxy Ace Plus. It's on the side position where the headset jack locate or above the 5MP camera. There is a gap in this top-side. Insert your fingernail or fingertip into this gap, then with a little press, gently lift the cover up (while the other hand hold still the body cover) until the cover partly removed. Continue to remove all the side until the cover casing fully opened. To attach the casing back to covered the rear body of GT-S7500, you need to align the cover with the edges-body of the phone, make sure the hole of rear camera is fit with the physical rear camera, then press the sides down until it locks and clicks. Make sure that there is no unusual gap between the body and the cover. If you find non attached side and some big gap, press the cover once more until it clicks. The SIM card slot of Galaxy Ace Plus locates on the left side of rear 5MP camera and above the battery compartment. It's better that the battery not yet assembled or had already removed before inserting the SIM card. The type of the SIM depend on carrier and region. But globally it uses Standard SIM / USIM card. Before you align the SIM card to the "door" of the slot, ensure that the gold-contact is facing down, and the corner-cut-edge is on the outside. After that, just slide and push the card until the card lock or reach the end of the slot and properly inserted. To assemble the battery, just slide the battery to the compartment and make sure the metal-connector on the battery connects to the connector on the compartment while the SAMSUNG logo is facing up. Press the battery to the compartment until the battery properly assembled. 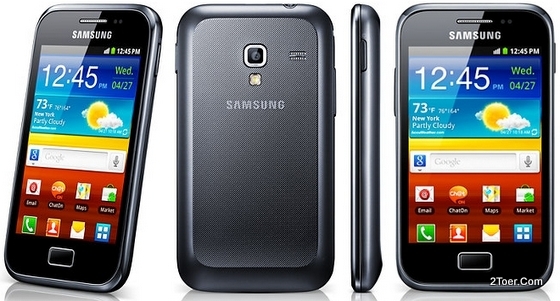 The memory type for external storage supported by Samsung Galaxy Ace plus is the microSD / microSDHC. Do not insert SDHC or any other type of memory card, and of course don't insert the SIM card into the memory slot and vice versa. To Insert the memory, just align the card to the slot (available on the left side of the phone (from rear facing point a view, pictured below), then with gold-contact facing down, push the card into the slot until it reach the end of the slot and locked. To unlocked and remove the microSD from its slot. You just need to push gently (remember PUSH it) against the slot, then it will unlock the card and make it pop out (eject). Finally, draw the microSD card out from it slot. Remember to unmount the microSD first before you do that. And of course you should remove / open the back cover before you can see the slot of the memory and able to insert into it. There is one biggest reason if you wanna do Hard Reset / Factory Reset on your Galaxy Ace Plus: You can't bear that your GT-S7500 too often on getting unresponsive, hang, and stop responding. Though there are other reasons such as you wanna clear all the settings and data and hand over your phone to other person or you just want to get back your phone to its original factory default. For Hang problem, please before you do Hard Reset, you must try to rebooting or force to restart the phone as your "soft" solution. Press the power button for 10 seconds and the device will reboot / restart automatically. But if the problem can't be solved with rebooting the device, just go to Settings > Privacy > Factory data reset > Reset phone > Erase everything to do Hard Reset.